Check out these awesome events that benefit Northern Michigan nonprofits! There are so many incredible nonprofits in the Northern Michigan community and heartwarming stories of neighbors, friends and family supporting each other through donated time, money and ingenuity. 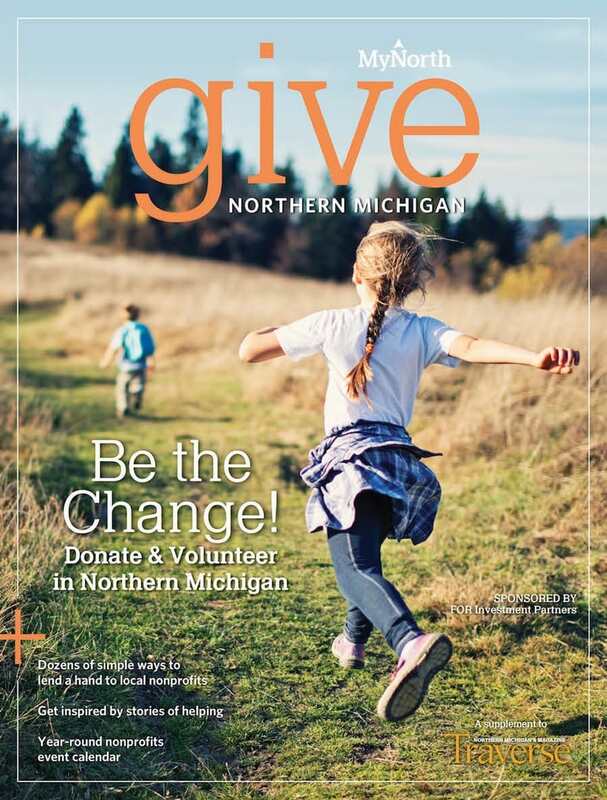 Read some of these stories and learn more about volunteer opportunities in the latest issue of GIVE Northern Michigan, a free MyNorth publication dedicated to connecting the community with local nonprofits. A uniquely wonderful, annual event featuring locally made and donated pottery from gracious artists and potters. Join us this year at Stafford’s Perry Hotel for soup and bread, while selecting a handmade bowl of choice. For each $10 donation, individuals can have a light lit on the CHS Christmas Tree in honor of a pet or loved one. Christmas Pet Food Drive donation barrels at CHS for pet food and supplies. 231.941.5116. Six couples dance off at City Opera House for six worthy charities including Communities In Schools, Special Olympics Michigan, TC Athletic Boosters and Traverse Health Clinic. Voters are encouraged to donate to the charity of their choice. Join thousands of revelers at the corner of Front and Park Streets in Downtown Traverse City this New Year’s Eve. Enjoy a live DJ for dancing in the streets starting at 10 p.m. with the countdown to the dropping of the cherry at midnight. The Goodwill Food Pantry, local food banks and select charities will benefit from donations raised. The Northern Michigan Small Farm Conference (NMSFC) promotes and builds a local vibrant agriculture community, equips the small farm community with the tools to be successful, and provides a forum for the open exchange of ideas within the small farm community. The conference routinely brings in more than 1,000 small farmers from across the state to gather, learn and network in Northern Michigan. 231.622.5252. The event will take place in the lower level of Castle Farms from 7–10 p.m. and will feature wine/beer/mead tastings, food, a silent auction and live music. All proceeds will benefit the Dolly Parton’s Imagination Library (DPIL), a literacy initiative sponsored by Char-Em United Way. The Imagination Library provides free books to children from birth to age 5 in Charlevoix and Emmet Counties. Over 50,000 books have been delivered to date. 231.487.1006. Raises awareness and resources for women and children staying at the Goodwill Inn. Brunch will be at City Opera House in Traverse City. 231.944.8320. All proceeds from the Hot Fudge Sundae Bar will go directly toward providing nutritious meals, compassion, security and independence for homebound seniors in our community. The sundae bar will run from 11 a.m.–9 p.m. 231.941.4122. 7th annual Instant Wine Cellar fundraiser for Char-Em United Way’s virtual volunteer center-Volunteer Connections. Music, dancing, fun, food, select wine and beer available, silent auction and raffle. 231.487.1006. Held at Grand Traverse Resort, 844.238.8508. If you’re into boating, needing to replace an item or just love to be around boat “stuff,” this event is for you. Typical items found at the event, held at 100 Dame Street in Suttons Bay, include boats, life jackets, line, sails, motors, maps/charts, books, decorative items and more. Inventory changes as new items are donated to ISEA. Date of the event scheduled for early spring. 231.271.3077. The ubiquitous little bags are found in newspapers across Northwest Michigan throughout the summer to call attention to the needs of children in foster care. Simply place your donation inside the bag, stamp it and mail it back to us. Or make an online donation. Watch the Crosshatch website for details, 231.622.5252. Enjoy 18 holes of golf at Walloon Lake Country Club. Lunch, dinner, cocktails, silent and live auctions and 50/50 raffle. If you’re interested in participating as a golfer, volunteer or committee member, please contact Grace Ketchum at 231.347.9742 ext. 118 or grace.ketchum@campdaggett.org. Mikey’s Fund is named after a very special person, Michaela Hagemann, who passed away in January 2003. Mikey’s fund provides eyewear and eye care services to disadvantaged school children, who could otherwise not afford it. Come join us for a wonderful round of golf at the Duck Lake Country Club, in Albion. For more information, 517.629.9015. Speed, excitement and smiles during this two-day boating event featuring high-performance boats slicing through the waters of Lake Charlevoix and Lake Michigan. Proceeds help the efforts of Camp Quality and Challenge Mountain. 231.582.9009. Join us for the 26th annual benefit art exhibition and sale for support of the Old Art Building in Leland. The exhibit promotes the artwork of more than 100 Leelanau artists, with 40 percent of art sales to benefit the operating fund. For information: 231.256.2131. This fundraising event includes local food and wine, silent auction, music and the preservation of the Legacy Award, bestowed annually to recognize those who have made a positive impact on Michigan’s arts. Held at the Crystal Center at Crystal Mountain, Thompsonville. 231.378.4963. Steve Holme, American Bird Conservancy, will be the featured guest at Saving Birds Thru Habitat’s annual fundraiser. Those in attendance will have the opportunity to speak with Greg and hear a short but highly motivating presentation. Wine and hearty hors d’oeuvres will be served. 231.271.3738. Day of Caring is a one-day, hands-on experience where volunteer teams from local businesses are matched with local non-profit agencies and schools to complete meaningful projects that fulfill agency and community needs. For a list of projects and to sign-up, check the United Way website. On the first Thursday of each month, Red Mesa Grill and Cafe Santé in Boyne City donate 5 percent of gross sales to The Manna Food Project to benefit the Boyne Valley, Boyne City Community and Boyne Seventh Day Adventist pantries. Michael’s Place celebrates the ‘everyday heroes’ we serve in this one-hour event. Please join us at the Great Wolf Lodge to see and hear very personally how Michael’s Place impacts the community. RSVP by calling 231.947.6453 or email goodgrief@MyMichaelsPlace. Established in 1983, Gladhander is the area’s premier gala! Gladhander provides vital funding to ensure the continued availability of a top-quality, Christ-centered education in Traverse City. Live and silent auctions, raffle prize drawings, fine food and drink, dancing and a late-night breakfast buffet. RSVP by calling 231.941.GLAD or online. Click the cover to read GIVE online! Traverse Magazine’s GIVE Northern Michigan is sponsored by FOR Investment Partners.